Over the last decade, I have extensively researched the topic of self-help and personal development. Although many authors make this topic complicated, achieving the life you desire is actually very easy. By following three easy steps, you can change virtually any area of your life — and did I happen to mention it is easy? In fact, you are already doing it and you don’t even realize it. Everything that is happening in your life, you have tremendous influence over and you are influencing every area of your life… even as you sit here and read this blog. With three simple steps, we can change anything in our life. In my travels, one of the most common questions I get from audiences is “I don’t know what I want in the future”. You see, when we know what we desire, creating the desire becomes very easy. So… how do we identify our desire? I always use two methods, the first is listen to what you emotions are telling you, when you feel negative emotions, fear, anxiety, stress and anger, stop for a second and ask yourself what are you thinking about and what is creating that emotion? Normally, you are really wanting the opposite of it. For example, if you feel anxiety or stress around a relationship or lack of a relationship, your desire is to have a meaningful relationship. You will also notice when you have happy emotions, you are normally thinking about the things that are going well in your life, and there is no coincidence there! If you already know your desired outcome, you can go right to the next step. Write your desires down on what I call a “dream sheet”. A “dream sheet”, if reviewed each day, will focus your attention on your desire with a laser focus. Think of it like a magnifying glass– if you move it around on a piece of paper nothing happens. but if you stop and focus the beam on one spot, the energy will create fire. 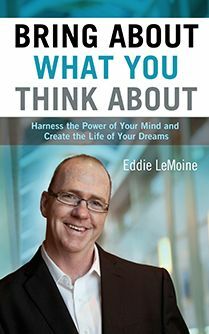 I go in much more detail in my newest edition of “Bring About What You Think About” and in my speeches, but it is safe to say if you write down what you desire and read it everyday, your life will start down a whole new path. If it is a relationship you desire, start to focus your beam of energy on what an ideal relationship would look like, and how you would act and of what would it feel like. Believing you can achieve it, is no place for the weak of heart. This is where you have to change your thinking. You can’t move in the direction you want by believing the opposite and as odd as it sounds, many people do it. You can’t have a perfect relationship by thinking “all of the good people are taken” or “I will act better when they change”. This is called conflicting beliefs, and you will find that you have lots of them in the areas of your life where you are not achieving what you want. Think about all of the wonderful things that happen in your life, and you will see your beliefs align with your desires and outcomes. For example, if you are wanting great physical health, you align your beliefs with your desires and you believe that you are in great physical health, you eat the right food and you exercise because that supports your beliefs in the outcome. Going back to the relationship example, all you need to have your desired relationship, is the belief that you can! You have to change any conflicting beliefs that may be holding you back, and believe the picture you are creating in your mind of the perfect relationship. So why did I say it is not for the faint of heart? Because, we can’t go into wanting a desire creating a fail-safe to save face. If you find yourself making excuses on why it may not work (to let yourself down gentle), in the event that perfect person does not come along, you are creating a conflicting belief. Take the leap of faith and believe you can have your desire. Being receptive, in the simplest terms, means becoming the person you would need to be, if you already received your desire. You see, the things that are going well in your life… you are already acting as if they are here, because they are and “there” is the key. Are we acting that way because they are here, or are they here because of the way we are acting? In my own life, I struggled with weight. One day I said Eddie, are you applying this principle in your own life? Being roughly 215 pounds, I had the desire to weigh 175 pounds, but I wasn’t acting like I had already achieved my desire. I took out a piece of paper and I wrote down all of the things I would be doing if I weighed my desired weight. What would I wear? What would I eat? How would I exercise and what would I feel like? Then, I wrote down a list of all of the answers to the same questions based on my 215 pound life, and there lays the gap. So I started acting like I already weighed my desired weight. I ate the food, exercised the way I envisioned it and I began to feel lighter on my feet. Within six months I weighed 175 pounds and I have never gone back to my heavier self. We can insert the example of the relationship into Step 3 too. Are you acting the way you would, if you already had the perfect relationship? Are you loving, caring, and giving? Do you demonstrate your feelings for the person you are with, in a way they would like to receive them? The key is to be the person you would need to be, if you already had the relationship of your dreams. I hope these three steps will have a profound impact on your life! Remember, “Live Your Dreams” ! in stores mid- June 2014!